Fresh install of Precise Desktop + updates upgraded to Trusty with "update-manager -d"
While it should be a graphical dialog if it does appear, I don't think it should appear at all. See bug 1105137. It looks like there is something awry in start_update() in DistUpgradeViewGtk3.py. Actually, that's right and DEBIAN_FRONTEND=gnome is appended to self.env. Did you happen to catch the core dump? I tested upgrading from Precise to Trusty again and observed a Segmentation fault error message in my /var/log/dist-upgade/apt-term.log file but could find no apport crash report. I spoke too soon, there is a gtk-update-icon-cache crash in /var/crash. I'm not convinced this is the cause of the gnome frontend not being used. I saw this crash too, but it is unrelated. Instead it could be because newest version of libgtk2-perl and its dependencies are not all installed on the system. From apt-term.log, we can see that libgdk-pixbuf2.0-0 is already unpacked but libgtk2-perl itself and its other dependencies are still at previous version. So when the gnome frontend is called by the trigger libgtk2-perl cannot be loaded. This diff should fix the prompt on the upgrade. I tried an upgrade from Precise Desktop amd64 to Trusty with the PPA enabled (eglibc 2.19-0ubuntu4) and the result is the same: Prompt in text mode. 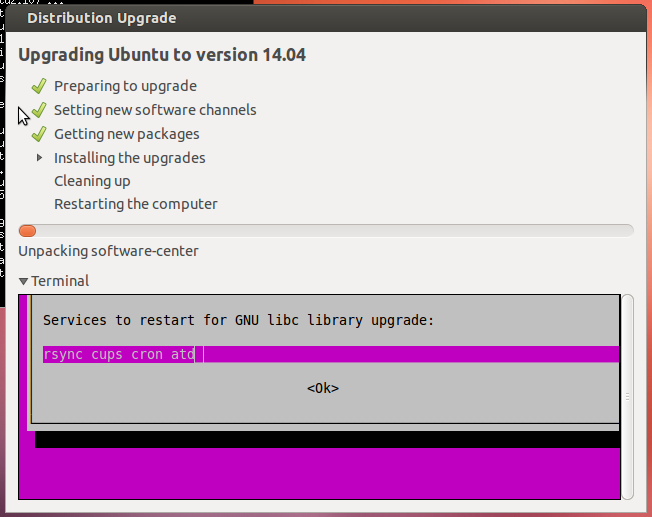 This didn't get auto-fixed because the task is about ubuntu-release-upgrader.